LOS ANGELES – The fight to stop foreclosures and make the banks pay continued on April 2, as across the nation, groups gathered to symbolically deliver 330,000 signatures on a petition calling on the Obama administration to reject U.S. Attorney General Eric Holder’s declaration that some financial institutions are too big to jail. The complete set of more than a quarter million signatures was delivered in Washington DC. Declaring that no one is above the law, the petition demands banks be held accountable for the crimes they committed against homeowners all across the country. • Charging illegal mortgage fees to about one million military veterans. • Cheating homeowners out of the government help to which they were entitled by pretending to lose homeowners’ documents, failing to credit payments and lying to them. • Forging foreclosure documents in order to evict people from their homes. • Illegally kicking 54 military families out of their homes. • Overcharging 10,000 military families for their mortgages. • Stealing millions from homeowners by adding credit insurance to their loans without telling them. Though Wall St. bankers crashed the economy, they were bailed out using trillions of taxpayer dollars and millions were harmed by their deceit, lies, falsifying of documents and making people believe they could own a home when in actuality they could not. 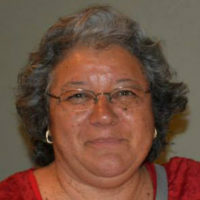 In Los Angeles, groups from the Alliance of Californians for Community Empowerment (ACCE), Good Jobs LA, and Service Employees International Union Local 721 went into a downtown Wells Fargo bank delivering trash from a home on which the bank had foreclosed. 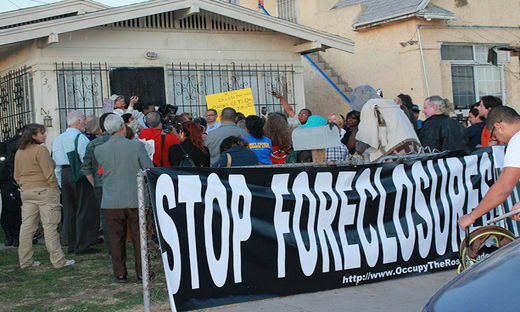 They demanded the bank maintain foreclosed homes to prevent neighborhood blight. Los Angeles City Council members were also visited to urge them to take a vote and put a stop to neighborhood blight by the banks. Angelina, an ACCE member, said she parks her car in the driveway of a foreclosed home next to hers, to keep squatters from coming in and destroying the property, which would lower her property value and that of the entire neighborhood. Under the California Foreclosure Registry Ordinance, banks are required to register foreclosed homes and maintain them to avoid neighborhood blight. This is not what is happening in Los Angeles, especially in the inner cities. Last year Los Angeles homeowners lost an estimated $4.4 billion in property values and $27 million less in property taxes, with low-income communities of color like South LA and the east Valley hit hardest. Los Angeles has not fined a single bank and has lost an estimated $45 million in violation fees for 2012 alone. Members of ACCE state that many long-term bank-owned properties have overdue blight citations. Cities like Oakland, El Monte, and Riverside have recovered millions of dollars in fines. When asked why Los Angeles has not cited a single bank, the city says there is no money for inspectors. An easy solution would be to raise registration fees – now $150 per property per year – to cover the cost of initial inspections of vacant foreclosed homes. Other cities such as San Jose charge fees of more than $1,000. A proactive inspection program to inspect all vacant foreclosed properties, with a strong program director with authority to coordinate with city departments and communicates with banks on the city’s behalf, is urgently needed to stop the drain of the city’s property values and tax revenues.